- DT SUGAR CHEX WHIZ, U$ 26,759 e 392 pts AQHA: 2016 Open Superior Tie-Down Roping, Open World Champion Sr Tie-Down Roping, 2015 AQHA World Champion Jr Tie-Down Roping; 2015 WHO World Show Reserve Champion Superhorse; 2015 AQHA High Point Heeling Horse; Superior ng, Heeling & Tie-Down Roping). 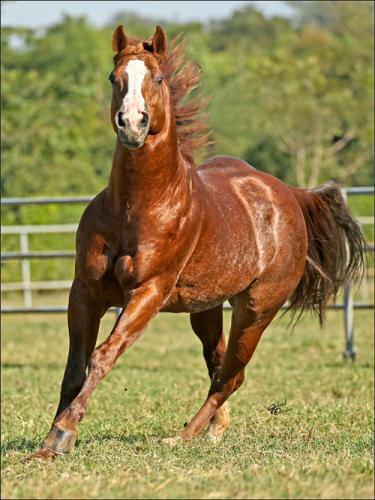 - DT SUGAR SHINE WHIZ: (US 23,313 e 237 pts AQHA) 2015 AQHA World Champion Jr Heeling; 3rd, World Show Jr Tie-Down Roping, 4th in 2015; Superior Heeling), 3rd, 2015 AQHA World Slow Superhorse. - DT ELENOR SHINE WHIZ, U$ 19,603 e 559.5 pts AQHA: 2016 Open High Point Daily Team Roping Heading, Open High Point Dally Team Roping Heeling, Open All Around High Point, Open World Champion JR Heading, Open World Show SUPERHORSE 3rd Place, 2015 AQHA Reserve World Champion Jr Heeling, 3rd in Jr Heading; Superior Heeling & Ranch Riding. - DT AMERICAN HONEY, 194 pts AQHA: top 10, 2016 Open High Point Dally Team Roping - 2nd Place, Open High Point PT JR Dally Team Roping Heeling 2nd Place, Open Superior Daily Team Roping Heading, 2015 AQHA High Point Jr Heeling; Superior Heeling). - DT AIR JORDAN: Campeã ARHFA Futurity 2017 Laço Cabeça. - DT SHINE BLUE BRANDY: Campeã ARHFA Futurity 2018 Laço Pé. Seu pai SHINING SPARK é ganhador US$ 62.674,00. Campeão Mundial AQHA ? Rédeas. Pai e avô paterno e materno de ganhadores de mais de US$ 11 milhões em Rédeas, WCH, Apartação e Laço, e mais de 34,509 pontos. Seus filhos premiados conquistaram: 35 World Championchip, 199 Performance Superior Awards, 17 Performance Championship, 28 Reserve World Championship, 40 Grand Championship, 48 Reserve Grand Championship, 68 All Around Championship, 77 All Around Championship, entre outros. Sua mãe LIL MISS SMARTY CHEX é ganhadora de US$ 18 mil, foi Res. Campeã NRCHA Open Stallion Stakes, e produtora de mais de US$ 434 mil. Produtora de RMT, de finalista Futurity NCHA, de Campeão AQHA e semifinalista Super Stakes NCHA.